Before you take any action with this strong and powerful ritual, consider your intention. Keep this thought clearly in your mind. Smudging should be done with care and reverence along with a positive attitude and that of love. Many people like to break off loose leaves and a candle may be used for them as well. In the very near future, Dr. Seth will have, along with the wonderful hand-made ceramic incense burners, smudge pots for the use of Smudging rituals. Over the years I have sold many bundles of sage and for the most part my customers knew what it was that they wanted to do with it and how they would and why they would “smudge” their environment. It has come to my attention that there is an interest in this activity. I will give some information and I am not professing to say these are the total of reasons and/ or activities of this technique. It is just a small taste of a ritual that is many centures old and used in many different ways with different herbs. 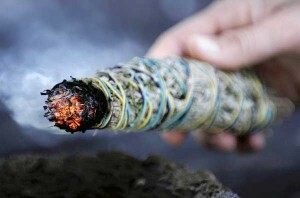 At Woodstock, we have provided Sage for most of our customers Smudging techniques. Smudging is the name given to the cleansing technique from Native American. This tradition of burning herbs for emotional, psychical and spiritual cleansing is practiced among many religious, healing and spiritual traditions. It is a ceremonial way to cleanse a person, place or object of negative energies. Smudging can be helpful for when you feel depressed, angry, and/or restful, You can smudge your home, work space or crystals to remove negative energy. Dr. Seth has an enormous collection of incense fragrances from around the world. 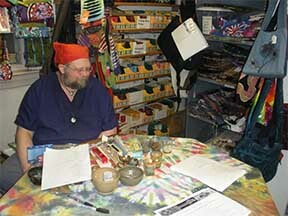 His keen sense of smell coupled with scientific knowledge of the composition and aesthetics of materials have made Woodstock Trading Company the “GO TO” place for incense and other fragrance products. He earned an M.D. degree in 1993 and decided his inner self would be better served working with his partner and mother (aka MOM) at Woodstock Trading Company. In addition, his creative talents and interests have led him into the world of ceramics. The wonderful hand made incense holders are hand thrown and designed by him. Come by and chat with Seth about his favorite subject and get some free samples!! Mention this Blog and he will see to it that Mom will pick up the tab on the sales tax of your order. I became aware of something I was doing for so long without much thought. I was applying patchouli oil directly to incense sticks. I guess without thinking, I was aware of a lack of convincing, true patchouli incense that isn’t choking and has a sweeter component to balance the bitter, earthy notes of patchouli. We do have some patchouli incenses, most of which I do have a high opinion. Having said that, I often feel the need for something more complex or balanced. Without being aware of that need, I added patchouli oil to some of my favorite incenses and it filled a void that I didn’t know I had until it was filled. This lead to the addition of other oils to incenses. Some had amazing, unexpected results (some good, some not). Clove oil on incenses gave them an interesting juicy fruit gum quality. I expected to get dental office and I got juicy fruit…go know. Failures involved lavender oil, which surprised me a bit, all citrus and any mints. The key to success is using a pure essential oil and a good sweet incense base. I especially have come to enjoy patchouli on sairanjani champa, satya super hit, satya natural, vampire blood, and goloka nag champa. Another point is to avoid getting any of the oil on the very tip of the stick that is to be lit. I also found that putting dots down the length of the stick with little patches without oil work best. That allows intervals of with and without patchouli to not fatigue the nose. Another point is to avoid getting any of the oil on the very tip of the stick that is to be lit. If the oil is ignited, it will burn like a torch and give off acrid sooty smoke…bad. I will continue to mess around with this process. Thus far, it has been interesting. One of the things that make us distinctively blessed is that we have an outlet for one of our hobbies. We are (for lack of a better word) amateur ceramics workers. Many hobbyist ceramics folks end up with piles of bowls and cups filling their cupboards, basements, attics, etc. The only outlet most have is to give away their work to the often unappreciative. The recipients closet their gifts and only get to see the light of day when the giver shows up. I was inspired by a combination of the classic Japanese joss stick burners, tea ceremony bowls and incense ceremony (Kodo) bowls. The evolution of the process to create these was so much more involved than I could have imagined. The types of flaws I was getting (and still sometimes get) baffled every ceramicist I could find. I found a way to prevent those flaws (most of the time) over years of trial. My new way is a bit of a pain in the keister to execute, but it works. Even more tweaking of design has undone other little issues of their use. All of these steps have added up to become quite the process, but here is why we are blessed. Since we couldn’t ever hope to profit from these incense burners, we have no reason to sacrifice on any efforts, time, or material. In fact, we sold a couple of these last week, so what do we do? We run out and buy $300 worth of more ceramics supplies. What madness is this? It’s our kind, and I wouldn’t post this if I felt you wouldn’t understand.